MentorFamily is a clone of such advertising-supported programs as MusicMain, BeautyMost, BabyMegs, and CareerPronto. It is no coincidence that all of these programs look similar and work in the same way. In fact, it is likely that all of them were created by the same company. Whether or not these programs are identical, every single one of them deserves removal, and there are quite a few reasons behind this. Continue reading to learn more about this advertising-supported software and its activity. If you are pressed by time, and you want to learn how to remove MentorFamily right away, scroll down to the last section of this report. Of course, we advise analyzing our findings to learn more about adware, as this could help you identify malware and protect your operating system from it in the future. 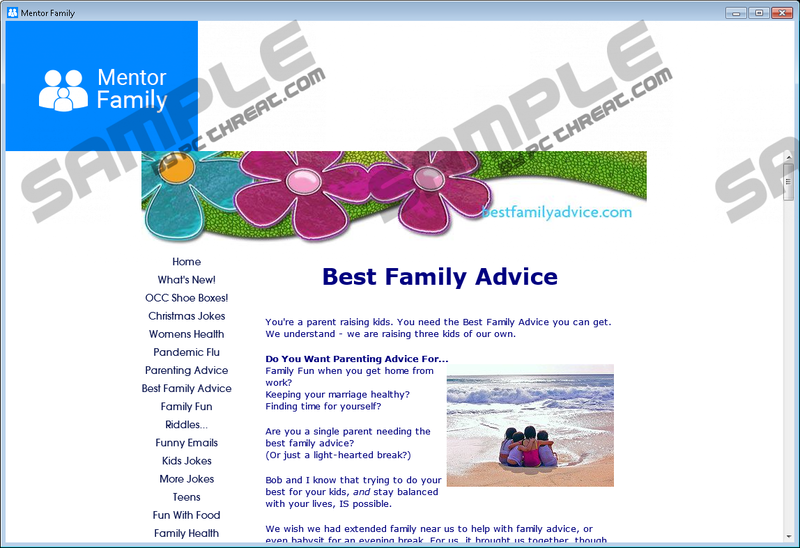 Unless you have downloaded this adware from mentorfamily.com, you must have acquired it using a third-party installer. Whether you are dealing with the official installer or third-party installers, you will be offered other programs. Which programs are introduced to you depends on where you live, as well as the time of the installation. MyPCBackup and Sweet-Page.com are just a few of the many programs that could be offered, and neither of them can be trusted. In fact, you should not expect MentorFamily to come bundled with reliable, useful applications. Instead, it will be packaged with PUPs, adware, and possibly dangerous infections. If you discover malware, you MUST eliminate it as soon as possible. Even if this adware comes as a standalone program, you should not ignore it. If you do, your virtual security could be jeopardized very fast, and that is not what you want, is it? As soon as the installation for MentorFamily is initiated, you will be exposed to online ads that are most likely to pop-up via a separate window of Internet Explorer. Whether you are redirected to pages hosted on interest6.valuedinformation.com, web.ionsmedia.com, or some other suspicious domain, you should not interact with the offers presented. Consumer surveys, prize giveaways, and other types of advertising could be used to expose you to scams, which is why you need to be extremely cautious. Unfortunately, you will be redirected to random surveys and ads automatically as long as adware is present on your PC. If you interact with them, tacking cookies will be installed, and they could be used to record and leak sensitive information. The ad-supported program itself could share information about you and your virtual behavior to third-party advertisers, and this is why some of the ads shown might be attractive to you personally. Needless to say, the only way to disable these irritating, potentially malicious ads is by removing the program enabling them. There is one more thing we need to mention before we start discussing the removal of MentorFamily. This adware has been found to enter operating systems using the installers displayed via search results. If you find that your regular search results become littered with sponsored links, ads, and strange content, you need to consider the existence of adware and browser hijackers. Right before you jump to the removal guide, use a malware scanner to identify all of the programs that are considered as threats and require elimination. Depending on the amount and the complexity of the infections found, you might turn to automated malware removal software. We strongly recommend this solution for less experienced users, and those interested in protecting their operating systems reliably. The right anti-malware software can help you erase malicious threats, as well as reinforce Windows protection and protect you from schemers. Here is what you need to do to delete MentorFamily from your operating system. First, delete the folders containing the files of this ad-supported program. Then eliminate the registry keys created by it. Finally, scan your operating system to see if you have succeeded. If leftovers exist, make sure you eliminate them right away. Another option you have is to uninstall this unreliable program; however, you might have to delete leftovers anyway, so you might as well stick with the option presented below. Of course, your best bet is to install trustworthy anti-malware software, especially if other threats have corrupted your PC already. Enter %ALLUSERSPROFILE%\Application Data\Microsoft\Windows\Start Menu\Programs\ into the address bar. Right-click and Delete the MentorFamily folder. Go to %ALLUSERSPROFILE%\Microsoft\Windows\Start Menu\Programs\ and repeat step 3. Go to %ALLUSERSPROFILE%\Start Menu\Programs\ and repeat step 3. Go to %APPDATA%\Microsoft\Windows\Start Menu\Programs\ and repeat step 3. Go to %USERPROFILE%\Microsoft\Windows\Start Menu\Programs\ and repeat step 3. Go to %PROGRAMFILES(x86)%\ and repeat step 3. Go to %PROGRAMFILES%\ and repeat step 3. Launch Registry Editor (tap Win+R to launch RUN, enter regedit.exe, and click OK). Right-click and Delete the keys with names of the adware. Click the Edit tab on the menu and select Find. Find and Delete the 1546B4F0-730A-4F36-88B3-5298FF931639}_is1 key. Quick & tested solution for MentorFamily removal.